British designer Tom Dixon, who is also one of my favourite designers, has recently opened a new restaurant in London: “The Bronte Restaurant”. 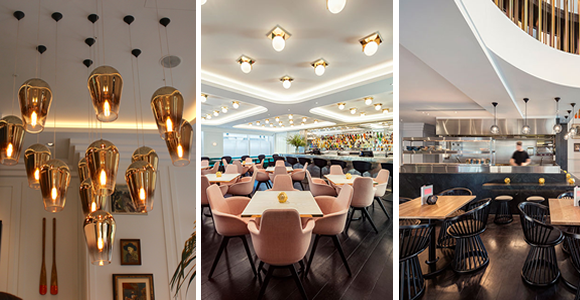 The restaurant features some fantastic furniture pieces and lighting fixtures that stem from the Tom Dixon collections. My interest in this iconic designer stems from his exhibition “The Chapel”, set up in Clerkenwell. The subtle, yet striking juxtaposition of styles is what caught my interest and the same inspirational designs and use of themes have been implemented to work around the restaurant. As they did around the church, the use of design and colours adapt to the environment that they are in, representing the main chosen theme. The regency building in which the restaurant has been created is situated overlooking Trafalgar square. The perfect position for it with Nelson’s statue being within eye sight range. The main inspiration for the restaurant is Lord Nelson, who was the first Duke of Bronté. Other British explorers and collectors play a part towards the themed design and this is all reflected through the building, the furniture sets, many artefacts and even the “Pacific/ Antipodean” style menu that is created by Andrew Lassette and prepared by head chef Jonathan Villar. The building in which the venue is located stems from a period where exploration and expeditions were at large. From the Golden Age, leading to the “Enlightenment period”, followed by the “Regency” period of national history, the designers have used colours, materials and art collections that keep close ties to these significant eras. The main interior features and focus points include a pink concrete breakfast bar, a green granite kitchen, a pewter cocktail bar and jade green leather banquet seating. It seems that the team wanted to implement furniture and materials that are going to last through time, just as the legacy of Nelson has done over the centuries. Geographical environments that skippers and explorers would have been discovering during these periods of history seem to have been incorporated throughout the restaurant as well. It seems that the pink granite reflects the coral reefs that they would have learned to avoid, the “shades of green” may be the tropical jungles they discovered and the pewter element perhaps a highlight of the growth in industry that was present at the time. The elements of colour and materials seem to create a dining expedition rather than experience! “A cabinet of curiosities” holds a collection of 16th century artefacts- a chapter in history when Elizabeth I reigned, often known as the “Golden Age”. This was an era where explorers were exploring more of the “New World”, which was very exciting. Tom Dixon seems to have used this collection to embrace the importance of this historical period and implemented this into the “exploration and travelling” theme. New found spices and culinary delights that were discovered throughout history are extended into the food dishes to try something new, just like the British population were doing throughout the periods of history. Despite embracing a historical past, the new menu and restaurant offers new experiences, in a modern setting. Wall shelves in the venue feature other personal artefacts from Tom Dixon and his team. These are placed in themed groupings- “nautical, botanical and geological” and placed throughout different sections of the restaurant. This may emphasise what we learned and found through the history of exploration. Having their own “findings” displayed adds a “personal touch”, representing their own expeditions. Having them grouped would also encourage visitors and diners to want to explore the rest of the room, taking in the rest of the displays. In addition to the structural masterpiece and artfully designed furniture pieces, what would a Tom Dixon restaurant be without his amazing lighting features making a debut?! A cluster of gold pendants, sitting over the dining booths. Using a metalized finish, the clusters reference heat and smoke rising from the kitchen. Located in ceiling coves throughout the restaurant, the subtle, steadfast lights reflect the type of light fitting that would have been preferable on the ship galleys during the themed periods of time due to the low ceilings in the ships. Having pushed the boundaries shows that something new has been discovered! “New geometrical light that pushes the boundaries of thin sheet etched metal fabrication”. With soft nickel coating, these beautiful light fixtures internally reflect and emit a filtered glow of “ethereal light”. They create a striking impact that creates a wonderful atmosphere for visitors to enjoy. The Bronte Restaurant offers inspiration and admiration from all angles. They are the type of feelings and thoughts that former explorers would have felt centuries ago during their expeditions. There is a sense of excitement and adventure that is offered to diners, creating a great new experience. A powerful use of colours and themes to reflect the culinary delights and national heritage. Not just a restaurant, but a work of art.